a hungry man travels: Chow Italia!! What? Yeah I know, lame heading, but isn't it just a little bit funny? I mean c'mon, this post is about food so see the connection?? Ciao – Chow?? Let's move on then. So now I've heard from a few friends that the blog is long on adventure and short on food, so I'm going to try to remedy that! I only had one full day to experience a bit of Italian cuisine, and I made the most of it. That one day was Christmas, where pretty much everything - except McDonalds (no surprise there – ya know, I think I going to count how many times I mention that place once this trip/blog is finished!) was closed for the holiday. Turns out it was serendipity that other restaurants/trattorias were closed. The hotel where I was staying featured one of Rome's top restaurants, so I made a reservation and proceeded to have a rather tasty, non-traditional (at least in my family) Christmas dinner. The restaurant is located on the top floor of the hotel. Hotel guests may get to the room via their floor but outside guests must go through a really quaint garden in order to take the private elevator. The room was done up in true Christmas fashion (tastefully), and each table offered some outstanding views of the city! Ya know, I'll bet in the summertime it must be stunning to look out over the roman hillside, with a nice warm breeze to accompany your al fresco meal. I think I'll find that out for myself one day when I go back to Italy! Right then, on to the food. I wasn't seeing turkey on the menu (surprise? ), but I was seeing one of my favorite pasta dishes; Pasta alla Carbonara. There is nothing like this true Roman classic dish for Christmas dinner eh? Ha-ha. Damn, it was so f**king tasty I'm salivating just remembering it!! After a rather bad starter of shrimp tempura served with a not-so-great dipping sauce, out came the carbonara. Now if you're a pasta lover, you'll love this dish: delicious spaghetti (or fettucini,rigatoni or bucatini), smothered in a sauce made from cream (or butter or olive oil), egg yolks and parmesan (pecorino romano), and topped with crispy, julienned bacon. This is a very, very rich dish, and it makes no apologies for that whatsoever. It was so freakin' good, so good - I repeat, so good. I practically kissed the plate when it was over - ok I didn't do that, but it was close. 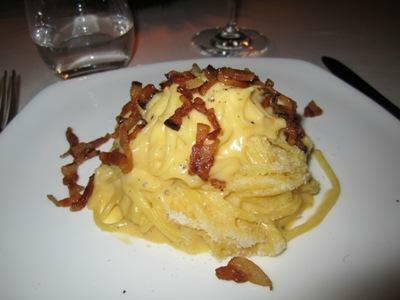 The dinner left me so full I had no room for dessert, but that's ok, I left the restaurant with visions and thoughts of carbonara on the brain. Now if only I could get that recipe. I asked, they laughed. They thought I was joking – I wasn't. Here it is, in full colour!